As the world moves toward a carbon-free future powered by clean energy, Denmark, Finland, Norway and Sweden are poised to spearhead sustainable development and reap its commercial benefits, experts pointed out at the Nordic Energy Research Conference on Thursday. Their technological and policy-related expertise would be instrumental in helping Korea embark on a new development trajectory free from coal, oil and nuclear power, they said at the maiden forum in Seoul. Nordic diplomats, researchers, academics, company executives, government officials and nongovernmental organization leaders participated in the event and shared ideas on sustainable energy solutions, policy innovations and civic engagement. 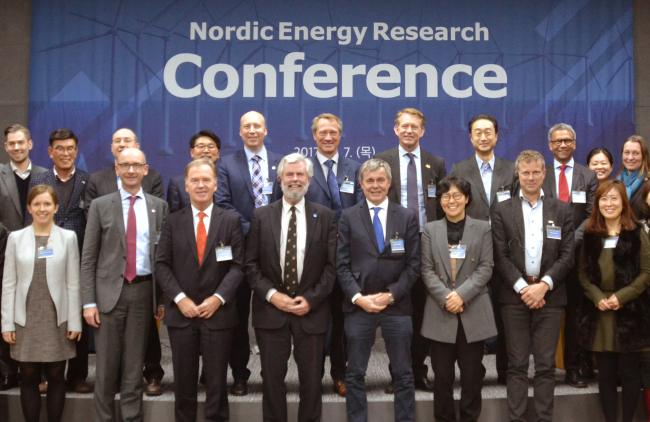 “The Nordic countries are far advanced in their solutions to achieving both their national energy targets -- covering energy security and economic competitiveness -- and global climate obligations,” said Hans Jorgen Koch, chief executive officer of Nordic Energy Research. He added the countries are some 25 years ahead of other nations on average in the electricity sector, proving potentially useful for cooperating with South Korea. According to the Nordic Energy Research, Denmark derived 66 percent of national energy from renewables in 2015, while Norway derived 98 percent, Finland derived 45 percent and Sweden derived 63 percent. Reducing emissions related to buildings -- by expanding district heating networks and phasing out oil-fired boilers -- is a key component of the energy transition, it said. Stable and ambitious carbon taxation, alongside incentives for renewables, have stimulated the growth of bio and wind energies. The Nordic electricity grid facilitates decarbonization by harmonizing the supply and use of electricity between the countries, such as wind power in Denmark and hydropower in Norway and Sweden. Denmark aims to eliminate coal completely by 2030, supply electricity and heating by renewables by 2035, and completely wean its economy from fossil fuel by 2050, he said. “Finland’s prosperity is based on our expertise in using renewable resources,” said Finnish Ambassador to Korea Eero Suominen, adding that over 70 percent of its territory is forest and the country has 188,000 lakes. Norway will become a low carbon society by 2050 by working with domestic and international partners, according to Norwegian Ambassador to Korea Jan Grevstad. Becoming a zero or low carbon economy is a goal shared across Nordic countries, which are at the forefront of worldwide efforts to limit global warming to less than 2 degrees Celsius above preindustrial levels, the target of the Paris climate agreement. Choe Nam-ho, director general of energy policy at the Ministry of Trade, Industry and Energy, underlined that President Moon Jae-in has pledged to increase the share of renewables to 20 percent by 2030, with solar and wind taking up 80 percent of total renewables. Members of the Organization for Economic Cooperation and Development -- of which Korea is a participant -- are spurring efforts to increase the share of renewables and natural gas, with renewables taking up over 86 percent of new investments in 2015, Choe pointed out. Korea has the lowest share of renewables in the OECD at around 5 percent of the national energy mix, according to the Korea Electric Power Corporation, as well as the highest territorial density of nuclear power plants. The country also continues to rely on coal through the continuing operation of coal power plants. Korea is in the process of transforming and optimizing its system of energy supply and demand by incorporating the Internet of Things, artificial intelligence and Big Data, among other things, he mentioned. As Korea’s energy system becomes decentralized and diversified through renewables and other sources, away from the monopolized nuclear power and oil, the participation of local actors -- governments, residents, NGOs and citizens -- will increase, said Professor Yun Soon-jin of Seoul National University’s Graduate School of Environmental Studies. “Stronger policies that encourage citizens’ involvement in the decision-making process is required for the energy transition,” she stressed.